C-3PO is one of the only Star Wars characters to appear in every movie. 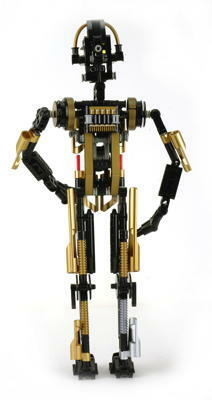 This slim, annoying droid is a natural choice for a Technic model, but even so this figure is not very impressive. His legs and torso have no articulation but are locked in a straight, rigid position. The arms use balls joints at the shoulder and elbow so are somewhat posable. The main feature of the model is the ability to "explode" after some stormtrooper blast damage. 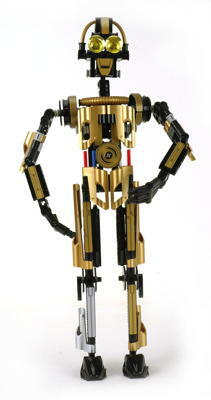 This model makes extensive use of a new metallic gold color. Note that this is not chrome gold which is used only for the dishes around the eyes. Rather, this a metallic paint that was applied on top of yellow parts. The yellow can still be seen inside the holes of the panels. This color was rarely used afterward. Visiting a tibanna gas mine with a protocol droid is a dangerous thing to do, especially when there are stormtroopers present. If your droid should happen to get blasted into 4 parts, you may have trouble re-assembling him without some Ugnaughts. In fact, the odds against doing it successfully are approximately 3,720 to 1. 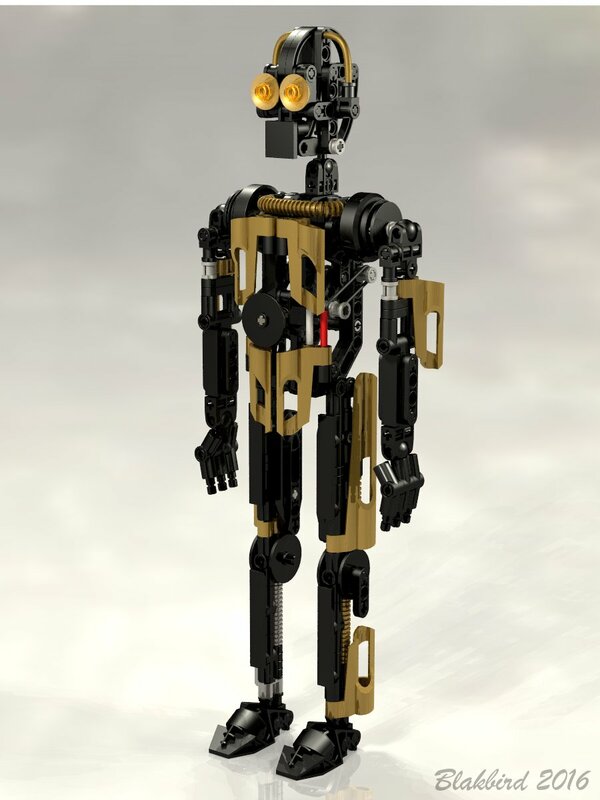 Depression of the round button on C-3PO's belly releases a spring loaded mechanism which causes his arms and head to detach from the torso. This is a touchy mechanism which can go off for no reason and is somewhat difficult to assemble again.